I have 3 jobs: testtt, testtt2 and testtt3. I use this jobs for testing a dynamic trigger via input parameter. In the "testtt" job I have String Parameter "next" with value "testtt2". This used in the "Trugger parameterized build on other projects" as "Project to build". In the "testtt2" job setting is same, but value of "next" parametr in "testtt3". In the "testtt3" job I have shell-script with command "sleep 500"
If I to start "testtt" job, he starting the "testtt2" job and the one starting the "testtt3". The "testtt3" job exercise sleep-command and it's fine. But "testtt" and "testtt2" jobs don't quit from queue when "testtt3" will not end (see screen). I have 8 workers in my server and if I create a 10 jobs in this way - I fully complete all queue in my server. (I need to create 22 jobs in future). 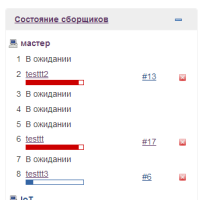 If I open "testtt" or "testtt2" job page, I see, what it is success. But in queue and console output he running. Can I solve or bypass this problem in my situation?